The PlayStation Vita, Sony’s newest entry into the portable gaming world, launches soon ( Febuary 22nd in North America) and we’ve gone hands-on with the device to tell you what you need to know. The Vita hardware has a lot of potential, a few problems, and a bunch of games that don’t take full advantage of the Vita's unique design. The first thing you notice holding the Vita is that the hardware is solid and relatively large for a handheld. I have relatively large hands (for reference, I refused to upgrade from the original Nintendo DS to the DSi since the larger body of the original was more comfortable for me to hold) and while using the Vita I needed to stretch my index fingers to tap the shoulder buttons. That isn’t to say the Vita was uncomfortable to hold; in fact, it’s surprisingly light and relatively ergonomic. However, some design allowances clearly had to be made to make room for the handheld’s 5-inch screen, and the device probably won't fit comfortably in your pocket. One look at the screen will tell you why Sony was willing to build a whole console around it. It’s crisp and clear and if the Vita feels a little big for a handheld, then the screen seems positively huge. I’ve never been a big believer in having more screen real estate on handheld devices, but the Vita certainly makes a strong argument for it. Video playback seemed solid during my short time with the device and I could certainly see myself making the Vita my portable video player over even an iPhone or Android device. Between the fantastic screen quality and the graphics of the launch games, the Vita often feels more like a scaled-down console than a scaled-up handheld. But while the hardware gets the big picture right, it stumbles a little in the fine details. The Vita’s twin thumb sticks were slightly too small for me to use comfortably, and I could see that minor annoyance becoming a major one during periods of prolonged play. The sensitivity of the Vita’s touchscreen also seemed slightly off, requiring just a bit too much of a push and taking a moment too long to respond to really feel natural. This was especially obvious when dealing with the Vita’s UI which, while pretty, fails to impress since it feels a little like a slighty sluggish (and more beveled) version of a typical iOS or Android interface. 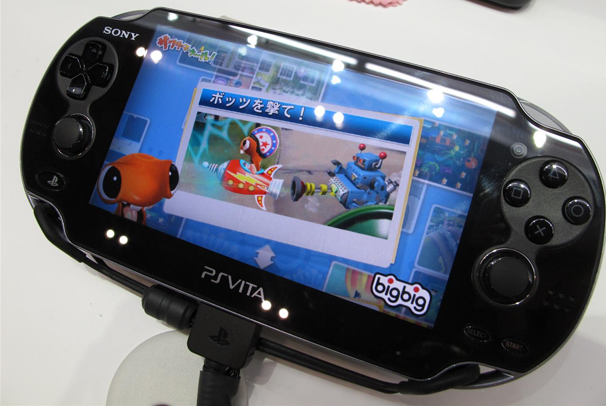 The PlayStation Vita's 5" OLED screen is big, bright and beautiful in person.. However, a lot of those problems fall away when you start actually playing with the Vita’s games. The graphics in first-generation Vita games like Virtua Tennis 4 and Uncharted: Golden Abyss are amazing for a handheld. The games really do feel at times like playing a console game on your handheld. Sadly, when the games try and take advantage of the Vita’s more unique capabilities the results (for now, at least) feel more gimmicky than anything else. For example, the touchscreen menu interface in Uncharted felt like an obligatory hurdle thrown in to remind you that you aren't playing this game on your PlayStation 3. This is a real shame, especially since the actual game at times does feel like playing Uncharted on the PS3, which is pretty amazing. Unfortunately, the hardware demos for the Vita’s camera and location-aware capabilities just feel like a reminder that the Vita has a camera and a GPS unit. Of course, many of the same criticisms were made of the Nintendo DS touchscreen at launch as developers struggled to figure out how exactly to take advantage of the posibilities of the hardware. We’ll have to wait and see if the PlayStation Vita can build a robust games library that takes advantage of it’s camera, GPS, and touch screen capabilities. In the meantime, keep checking PCWorld for more info on the Vita launch and be sure to come back next Monday for our full review of the Vita.